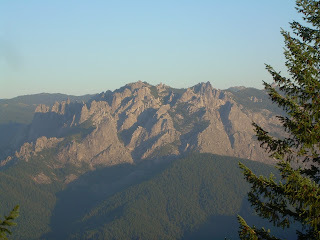 Castle Crags--from a viewpoint I'd never seen before! 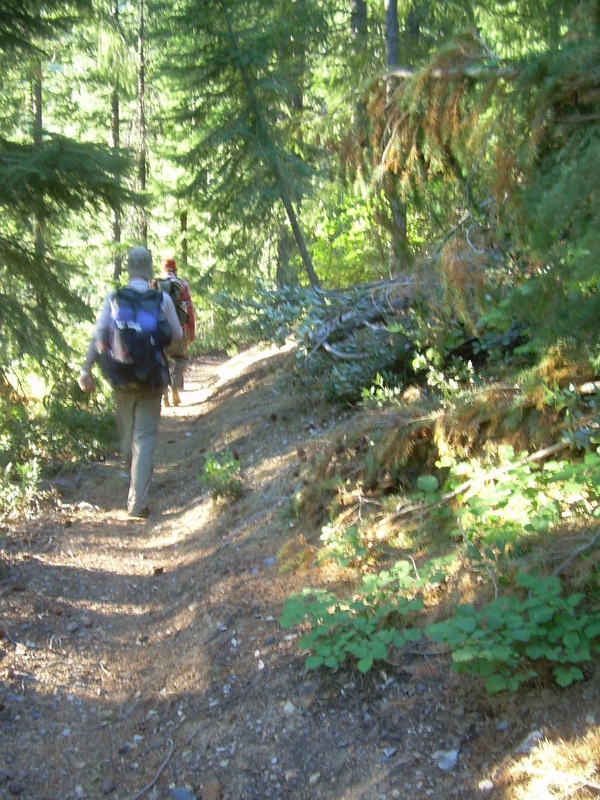 July 30: Johnny Law, Missing Link, and I started hiking out of camp together. We had about 11 miles to get into Dunsmuir, all downhill. It would be easy! A few miles later, I skipped ahead of Johnny Law and Missing Link. They stopped at the next water source, but they were religious about filtering water after getting sick from giardia in the High Sierras. Me--I filled up a Nalgene bottle straight from the source and continued on. I didn't need a lot of water to get to Dunsmuir, so I wasn't going to carry a lot of water. From a distance, I could see Castle Crags, a famous landmark along the I-5 corridor of exposed rocks towering above the surrounding area. It was a unique view of the rocks, which before I had seen only while driving along I-5 and, once, I stopped to hike in. The view from the trail here looked like an aerial view taken from the use of a helicopter. Very cool! Johnny Law and Missing Link. The trail dropped quickly, crossing a small bride over a river, a couple of railroad tracks, until hitting Interstate 5. The trail crossed under I-5, but Dunsmuir was 4.5 miles north on I-5. 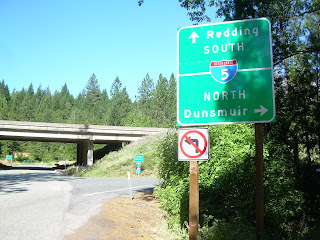 Not wanting to walk, and in fact, not knowing any legal ways to walk to Dunsmuir (pedestrians are strictly prohibited on Interstates), and not wanting to walk 4.5 miles off the trail, I stood by the on ramp for I-5 and stuck out my thumb. It was time to hitchhike. I didn't have long to wait. About one minute after I stuck out my thumb, two vehicles passed by, and one--a white van--stopped. The driver leaned over and asked where I was headed. "Dunsmuir!" I told him, and he welcomed me in. On the quick ride to Dunsmuir, I asked where he was headed and learned he was going to Mount Shasta City for radiation treatment. The man suffered from brain cancer and seemed remarkably upbeat, telling me that it was going well so far, he was no longer seeing double vision, and was now allowed to drive again. Wow. I didn't know what to say. Here I am, doing something frivolous, wasting five or six months of my life hiking a trail, and this man was dying of brain cancer. Well, maybe dying. I didn't know what his chances of making it through were, and I didn't want to ask. On second thought, however, I decided that my hike wasn't frivolous. This man would probably love to trade places with me in a heartbeat. There is a world of people who wished they had the same problems I did. Here I am, worrying about where I'll sleep for the night, or where I'll be able to get my next water from, and it seems like a trivial thing to worry about in the grand scheme of things. There's a world of people who probably wished they could be so trivial as well. I'm still not sure if the man inspired me or depressed me--or maybe a little of both. The on ramp where I hitched a ride to Dunsmuir. He dropped me off at the post office in Dunsmuir. I'd been to Dunsmuir before, while driving through on I-5, but had never been to this part of town. 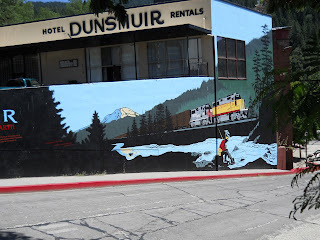 Dunsmuir is what I would call a "working town." It was a major train stop and well past its heyday, but leaves behind a town filled with stories and historic buildings of another era. I picked up my maildrop from the post office--the camera Amanda had mailed arrived on time, and I could finally retire the unreliable (but still occasionally working) camera I'd carried since Mexico. I walked into town, looking for the Burger Barn, supposedly a popular hiker hangout. After a few blocks, I didn't see it and headed into a Pizza Factory instead. Pizza is good too! There, I checked out my new camera, installing the batteries, taking a couple of photos to make sure the thing worked, and played around getting familiar with the settings. I also wrote a few postcards before I left and walked back to the post office to mail them. 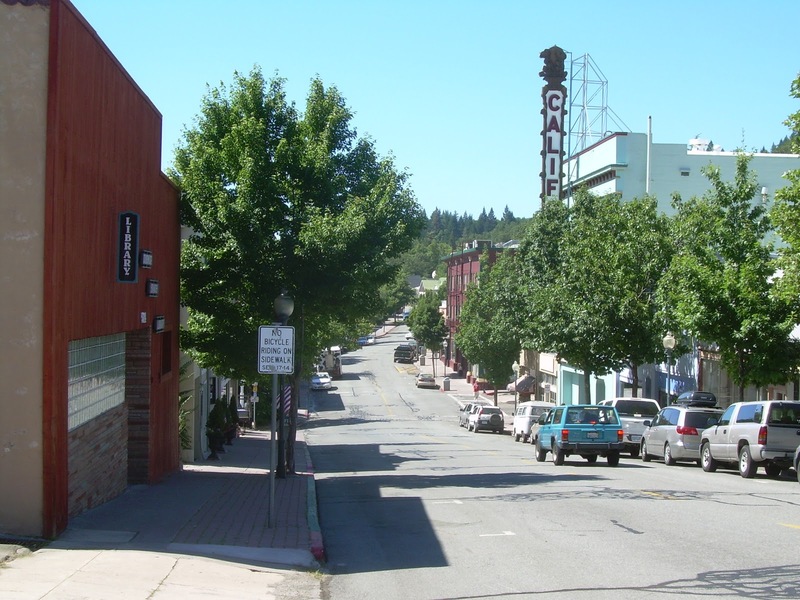 Rush hour in downtown Dunsmuir. On the way back, I spotted Johnny Law walking on the far side of the street and shouted a hello as I jaywalked across the street. He asked how long it took me to hitch a ride, and I told him less than sixty seconds flat. He cussed, saying that him and Missing Link waited over an hour to get a ride. They were surprised when they first got to the road and didn't see me--they knew I wasn't far ahead--but it seemed like I had up and "disappeared." Surely, they thought, there was no way I could have gotten a ride that fast! I mailed postcards at the post office, then crossed the street again to the market where I bought enough food to get me through the next stretch. Outside, I rebagged everything into ZipLocks, carried my pack to the pay phone in the shopping cart, then dropped my pack by the pay phone. "What's in the bag?" I asked her. She ignored my question, but looked a little startled to see me. She started to walk off, leaving the plastic bag with my pack. I looked in the bag to find a Clif bar, an apple, some trail mix, and other assorted trail foods. WTF? She definitely meant to target me, but why the "stealth attack"? Clearly, she didn't realize that I was returning so quickly and I caught her by surprise. I looked up from the bag, and the lady was gone. How the heck such an old, slow-moving woman disappears in thin air is a mystery I have yet to figure out, but it happened. She was gone. I know I didn't imagine her, though. I had a plastic bag filled with hiker food as proof, but the whole incident was a little creepy--like the beginning of a horror movie where everyone dies a violent death by the end. It was time to get back on the trail. I wasn't sure where the nearest southbound on ramp for I-5 was, so I entered the grocery store and asked a worker where I could find it. He pointed me up up the street where I had gotten off of I-5, but then asked, "Are you a hiker?" 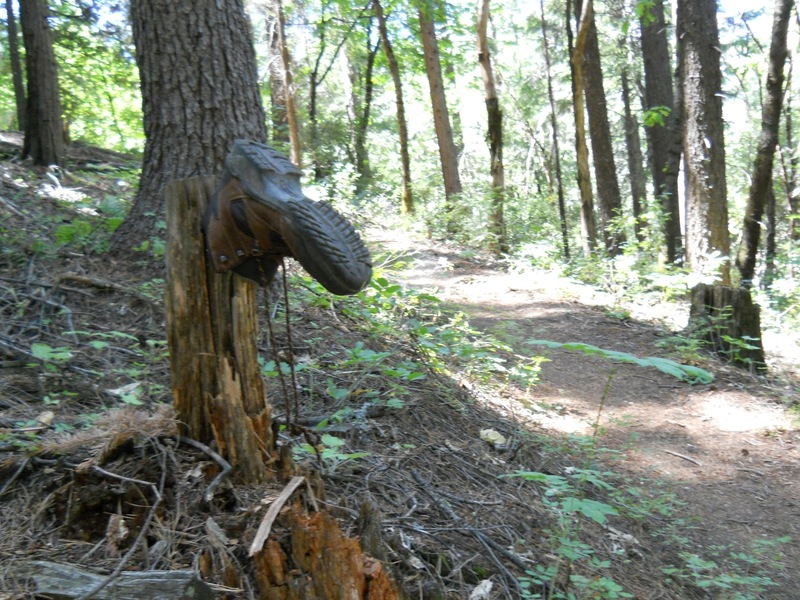 "The owner here sometimes gives hikers a ride to and from the trail." Him: "But he's not in right now." Him: "But when he comes back, I'll let him know there's a hiker trying to hitch a ride back to the trail. Perhaps he'll pick you up." 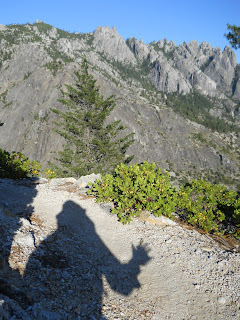 He dropped me off a few minutes later, right where I got off the trail at, and I started hiking into the depths of Castle Crags. The trail, at first, was in the trees and largely boring, but eventually it came out along the crags where spectacular views awaited. As did a very steep climb uphill. I managed to hike another 14.8 miles out of Dunsmuir, accidentally bypassing a "creeklet" that was so small I didn't think it counted as a "creeklet." I walked about a half mile past it before I had to admit that that was likely the last water source for the next 13 miles, and I needed more water before that. So I backtracked the half-mile back to the creeklet, grumbling about the extra walking but nothing I could do about it, finally setting up camp alongside the trail. The views, at least, were awesome. By the end of the day, I covered 26.0 miles, which impressed even myself when you consider that I spent four hours in Dunsmuir killing time. I was burning up the miles! What a great story! And an angel visited you with goodies how sweet! Aww! What a great story! 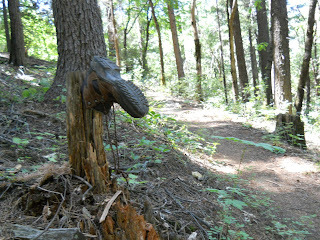 And such a kind and generous trail angel wanting to surprise you with some trail food for your journey. She probably just didn't feel comfortable accepting praise or thankfulness and wanted to be incognito. You just never know the real story. Maybe her husband was a PCT thru-hiker and had passed away and she wanted to give back in honor of her husband? All I know is that I hope you told her thank you. I just checked out that link with the photo...and I think I'm going to have nightmares. Yipes!!!! !